Dr.A.K.Gupta is a leading physician and academician. He is a Member of Homoeopathic Advisory Committee Govt. of Delhi. He is the Author of “The Problem Child and Homoeopathy” book and presented many papers in international conferences. He was graduated from Nehru Homoeopathic Medical College. He had received many awards for his excellence in service. 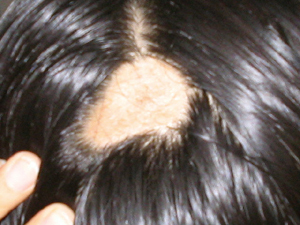 Here he presents a case of Alopecia areata. A twenty years old girl consulted me for patchy hair loss on her scalp since six months. 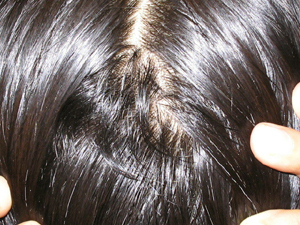 Initially Alopecia areata started as a tiny patch and later it grew into a big patch more than a silver coin. Her associated complaint is chronic constipation. She had ear discharges in childhood and suspected mastoiditis by x ray. Her parents are hale and healthy. Recently she had suffered from typhoid. She is short-tempered and doest not bear contradictions. Egoistic, Quiet apprehensive, Anxious, Easily frightened. She desires company and broods over many things. She has desire for sweets. Chilly patient. Her periods are very regular. Started feeling bit itchy over the spot. Much better in general, started getting hairs on the spot. Hairs coming regularly , Patch almost disappearing. Patch completely filled with the hairs and case got cured. An opening prescription on miasmatic basis followed with an indicated remedy cured this case. The photographs captured during the treatment also given here.